Non-native characins, like the pacu, have been introduced to every New England state except Rhode Island. Over the past year, I’ve covered several stories about introductions of non-native, exotic fishes to U.S. waters. While most of my work on the topic has focused on non-native marine fish species in Florida, I thought it might be interesting, given that I live in Maine, to take a look at non-native fish introductions in New England. Maine is frequently criticized for having an overly protective approach to both the importation and possession of non-native fish species, and the topic often makes headlines in state and even national media. For example, local media is currently covering efforts to remove non-native Carassius auratus (goldfish) from a pond in Belfast, Maine, and a high profile, protracted dispute between a resident of Harpswell, Maine and the Department of Inland Fisheries and Wildlife over pond-kept Cyprinus spp (koi) received national attention when it ended in the exotic fish being confiscated and, ultimately, euthanized by the State. Non-native fish species that become established in New England waters can wreak havoc on native fish populations. Maine, for example, is the most important repository for wild Salvelinus fontinalis (brook trout) broodstock in the country, and fisheries managers have documented entire populations disappearing secondary to non-native fish introductions. Salvelinus alpinus (Arctic char), another embattled Maine species, has also suffered secondary to non-native fish introductions. In addition to established non-native fishes, non-native fishes that don’t become established still pose a risk. Even if they fail to form a self-sustaining, breeding population, non-native fishes can be be a vector for diseases and parasites that can negatively affect native wildlife. What is the actual risk associated with the introduction of non-native species? What do we really know about the species that have been introduced? Have extant regulations been effective? Are current laws too restrictive? Not restrictive enough? Over the course of the next few weeks, I’m going to dedicate some time to educating myself on the issue of non-native fishes in New England. I’ll share much of what I learn here at The Good Catch Blog. If you have thoughts or questions, I hope you’ll reach out either in the comments at the end of a blog post or via email or The Good Catch Facebook page. 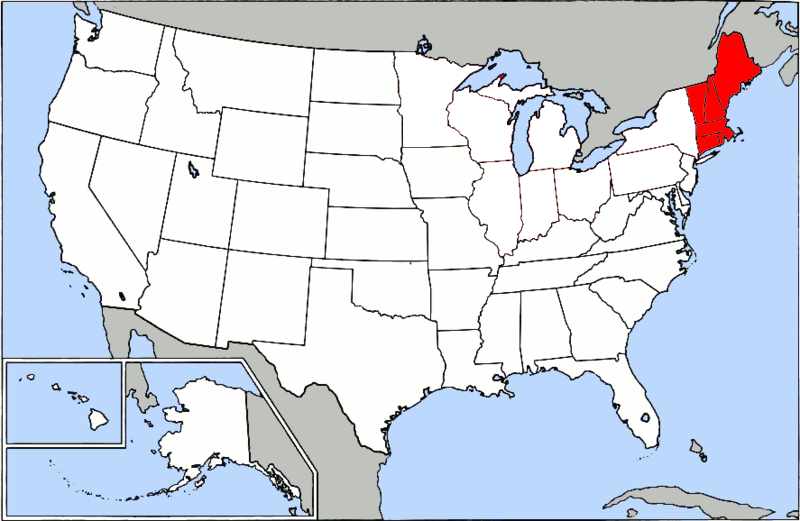 The six New England states shaded red are Maine, New Hampshire, Vermont, Massachusetts, Rhode Island and Connecticut. For the purposes of this series, I’ve defined New England as Maine, New Hampshire, Vermont, Massachusetts, Rhode Island and Connecticut. The southern tip of Connecticut (the southern most state in New England) is at a latitude of roughly 41°, and the northern tip of Maine, New England’s northern most state is 47° 28’N. I point this out because it’s important to remember the climate of New England is a limiting factor for non-native fishes introduced to the region from sub-tropical and tropical climates. In terms of data, I’m relying heavily on the United States Geological Survey‘s (USGS) Non-indigenous Aquatic Species (NAS) database for this discussion. It’s important to keep in mind that not all introductions have led to established populations, and in some cases, a species is believed to be completely eradicated after a documented introduction (e.g., Piaractus brachypomus in Maine). For the purpose of this post, I am defining “non-native introduction,” as the USDA database does, as the introduction of an exotic species. By exotic, I mean not native to the United States. There are also so-called “native transplants” (e.g., Micropterus dolomieu and M. salmoides in Maine) that are important in terms of their effects on native fishes and ecosystems, but I’ll address those in a later post. 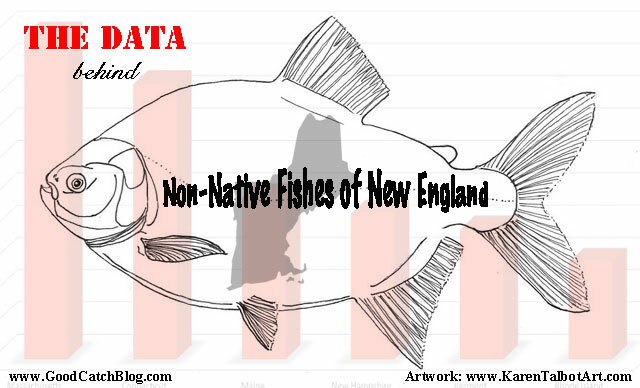 Within New England, the NAS database shows Massachusetts has the highest number of non-native, exotic fish (marine and freshwater) species introductions and Rhode Island has the least. According to the data, the number of non-native, exotic fish introductions does not correlate to how much aquatic habitat a state has. 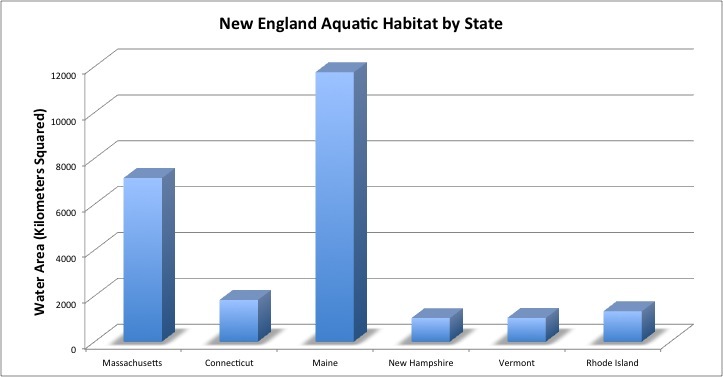 For the six New England states, Maine has by far the most aquatic habitat (11,750 square kilometers), but it has half the number of documented non-native species introductions as Massachusetts, the state with the next largest water areas (7,134 square kilometers). While there are many other factors to consider (e.g., port size, aquaculture facilities, number of pet stores, number of recreational anglers, etc. ), it seems that the number of non-native, exotic fish species introductions in New England correlates better to a state’s population size than its amount of aquatic habitat. Massachusetts, the most populous New England State, has seen the most number of non-native, exotic fish introductions. In fact, a state’s rank in terms of number of introductions correlates in every case except between the two states with the lowest populations–Rhode Island and Vermont. Vermont, which has the smallest population of any New England state, has eight documented non-native species introductions, while Rhode Island, with the next smallest population, has seen just six. Within the six New England states, the USGS NAS database lists approximately 30 species of non-native fishes from 11 families. Several of the listings are only identified to the genus level and may represent some duplicates. There are also several hybrid species listed. Perhaps not surprising, the most common family of non-native fishes represented in New England is the family Cyprinidae, commonly know as minnows or carp. This family includes both Carassius auratus (common goldfish) and Cyprinus carpio (common carp), which have both been introduced to every New England state. Ctenopharyngodon idella (grass carp) have been reported in Massachusetts, New Hampshire and Connecticut. Four other species from the family Cyprinidae have been introduced to New England States. The are Tinca tinca or tench (MA, ME, VT and CT), Scardinius erythrophthalmus or rudd (MA, ME, VT and CT), Leuciscus idus or ide (MA, ME and CT), and Danio rerio or zebra danio (CT). Snakehead species from the family Channidae (milkfishes) have been introduced to all New England states except Vermont and New Hampshire. Channa micropeltes (giant snakehead) were introduced to Maine, Massachusetts and Rhode Island, while both Channa maculata (blotched snakehead) and Channa argus (northern snakehead) have been introduced to Massachusetts only. The family Characidae (characins) includes piranhas, pirapatingas and pacus, which have been introduced throughout New England except Rhode Island. Piaractus brachypomus (pirapatinga) is best represented, having been introduced in Maine, New Hampshire, Vermont, Massachusetts and Connecticut. The closely related Colossoma macropomum (cachama) was reported as introduced to Massachusetts, and unidentified pacus/pirapatingas from either the genus Piaractus or Colossoma have been introduced in both Massachusetts and New Hampshire. Piranha species, including Pygocentrus nattereri (red piranha) and unidetified species from the genus Pygocentrus or Serrasalmus are reported in New Hampshire, Connecticut and Massachusetts. 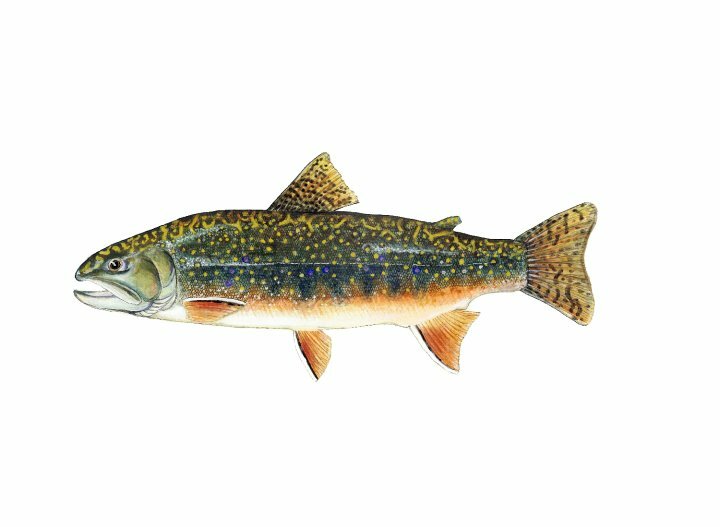 Many trout and salmon from the family Salmonidae are native to New England, but Salmo trutta (brown trout) is a non-native, exotic species that has been introduced to all six New England states. In addition, Salvelinus alpinus (arctic char) have been introduced to New Hampshire and Connecticut, and two hybrids–Salmo x Salvelinus trutta x fontinalis (tiger trout) and Salmo salar x trutta (sambrown)–have been reported in New Hampshire and Connecticut respectively. Two other species from the Family Salmonidae are reported to have been introduced to Maine: Coregonus wartmanni (blaufelchen) and Coregonus albula (vendace). Suckermouth catfish from the Family Loricariidae (Hypostomus sp) have been reported in Massachusetts and Connecticut. A species of knifefish (Chitala ornata, commonly called the clown knifefish) was reported in Vermont. Betta splendens (Siamese fighting fish) from the family Osphronemidae and Poecilia reticulata (guppy) from the family poeciliidae were both introduced in Connecticut. Only one marine species is listed as introduced to New England in the USGS NAS database–it is Pterois volitans/miles (lionfish) from the family Scorpaenidae, and it is reported to have been introduced to Rhode Island. This entry was posted in Invasive Species, Maine Fisheries, Massachusetts, Northeast Fisheries and tagged arctic char, brook trout, brown trout, carp, Connecticut, exotic species, invasive fishes, knifefish, lionfish, minnows, New England, New Hampshire, Non-indigenous Aquatic Species, non-native species, Pacu, Piranha, Pirapatinga, Rhode Island, Siamese fighting fish, snakehead, suckermouth catfish, United States Geological Survey, Vermont. Bookmark the permalink. This whole artical and no mention of the non-native rainbow trout stocking!!! The most extensively stocked fish in the north east!! Thanks for reading and commenting. You are absolutely correct that rainbow trout are stocked throughout New England. This article uses data from the USGS Non-indigenous Aquatic Species (NAS) Database and defines non-native (exotic) as not native to the U.S. Rainbow trout are, of course, native to the US (but not New England), and that is the reason for the confusion. For the purpose of this series, rainbow trout are a “native transplant.” In the latest episode of my podcast (www.BeyondDataPodcast.com), rainbow trout are clearly identified as a non-native species in Maine.